The Samsung S5380 Wave Y comes in a small box with a microUSB charger, a microUSB data cable and as well as a quick start guide. To complement the rather limited 150 MB of internal storage, Samsung have included a 2 GB microSD card, complete with an adapter. 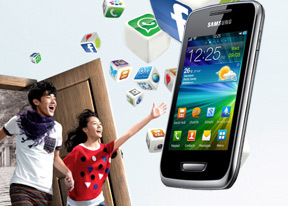 The Samsung S5380 Wave Y measures 110 x 58.5 x 12.3mm. In terms of dimensions, it is very similar to the Samsung S7250 Wave M, although the slightly smaller screen allows the Wave Y to maintain a more compact form, and shave off almost 20g of weight, coming in a tad over 100g. The Samsung S5380 Wave Y's all-plastic body is solid and feels good, weight-wise. The capacitive screen doesn't dominate the front like on most higher-end Samsung smartphones, and it doesn't have that oversized look when compared to the frame. The back panel features a stylized groove which gives the appearance of a partially removable back panel area, but in reality the entire back part of the phone is revealed when it is removed. We'll take it apart further down. The display unit is nothing to write home about, but does an adequate job at displaying content with a decent ~180 ppi pixel density. Its reflectiveness can have a moderately adverse effect on how visible the screen elements are in sunlight, and the screen surface is slightly prone to fingerprints and smudges, but not overly so. Samsung I9100 Galaxy S II 0 231 ? 0 362 ? Like the Wave 3, the Wave Y uses capacitive call keys around the physical Home key. They're not backlit when idle and the single massive Home key is a prominent accent on the otherwise sparse front. The bad thing we noicted is the backlighting of the capacitive controls is somewhat hazy, and worse yet, they're not haptic enabled. In fact, haptic feedback isn't available for the touchscreen either. Above the display and logo is the earpiece and a barely-visible proximity sensor. There's no ambient light detector and no automatic brightness setting for the Wave Y's screen. The left side of the Samsung S5380 Wave Y features the volume rocker, which has comfortable thickness and is easy to locate by touch and press. There is also a lanyard eyelet, as well as a small crevice for prying off the back panel. The Lock key on the right is smaller and more flush to the side of the phone, which can make hitting it with accuracy a bit tricky. There's no dedicated camera key on either side. The top of the device features the 3.5mm audio jack resting on a fixed surface that's not part of the back panel. Conversely, the bottom area has an opening cut for access to the microUSB port. This is also where the microphone hole is located. Around back, the only interesting parts are concentrated near the top, where the 2MP camera lies next to the speaker grille. There is no LED flash to speak of. The camera lens is sufficiently recessed into the body of the phone, which keeps it out of the way of scratches and fingerprints. The loudspeaker on the other hand only has a small nub, which doesn't help against the sound getting muffled. The back features a standard plastic rear panel, which gives access to the battery, SIM and microSD compartments. As stated above, the groove along the back panel is entirely aesthetic, only gives the appearance of a dedicated lower area of the phone. By using the small crevice on the left side of the phone, the entire back and bottom cover of the phone comes off. The panel itself is made of a very flexible, almost rubber-like plastic, which nevertheless fits tightly against the phone. Underneath, the 1200mAh battery provides 6 hours and 40 minutes of talk time, and up to 570 hours of standby. As usual, the SIM card is accessed by removing the battery. The microSD slot is also located under the back panel, which eliminates some of the convenience of having a hot-swappable port in the first place. After all having to remove the back panel is not too many steps away from having to take out the battery. Nonetheless, a hot-swappable microSD port is one of the few advantages the Wave Y has over some of the higher-end phones in the Wave lineup, like the Wave I, II, and 3. The Samsung S5380 Wave Y is a solid phone for its price. It has good construction and decent functionality, while retaining compact measurements and an acceptable weight. If compactness is your thing, the Wave Y looks good and feels right in hand, too. Up next is our tour of the Bada 2.0 OS complete with benchmarks.